This on-going project was already introduced here http://www.myArmoury.com/talk/viewtopic.php?t=23870&start=20. Initially, I didn't intend to show the whole step-by-step process of its making, because I didn't want to take up any more of your time with this; but lately I changed my mind. For doing this, I was encouraged by Mr. Sean Flynt and his own "Early 16th c. Longsword Project". Thanks, Sean! 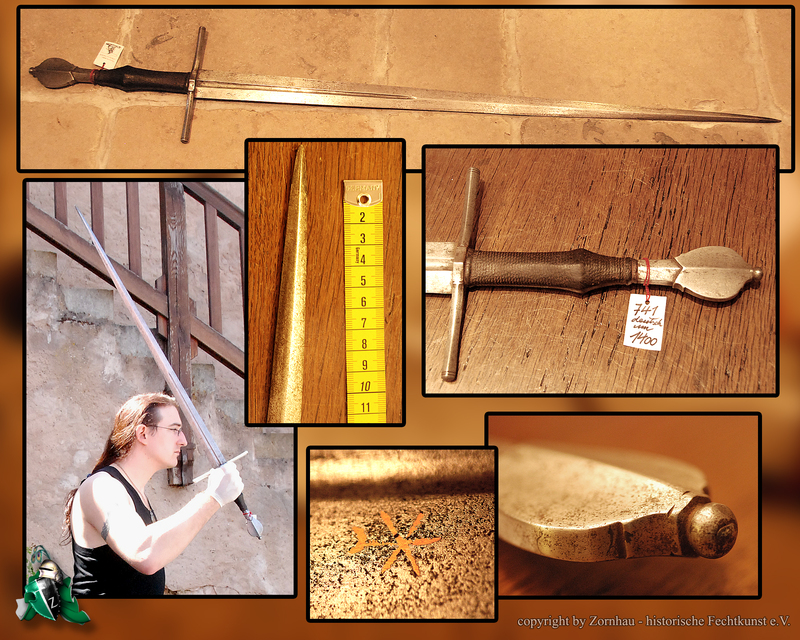 The project is German Type XVa hand-and-a-half sword, although the blade has a fuller, which is not typical for its type. found at the page of the Zornhau - Thanks a lot, guys! You really do an amazing work! is the final result. The next step is the heat-treatment. I really like the aesthetics of this kind of blade with a short fuller and looking forward to seeing the rest of the project in progress pics and comments: These types of Topics are always interesting and educational and fun. Till waiting for the heat-treated blades (and beside two Finnish puukko, one broken-back seax and one khanjar for the "Yushman Project", which I make in parallel currently), I decide to work over the guards and the pommels of both swords. I had much doubts about the pommel here, and particularly - about the hole, running through its whole length, which is 110 mm. But today I managed to drill it quite easy, working on both sides. In the middle (which was my greatest concern) the two holes cross-passed each other with difference less than one mm. This was re-worked with a reamer. As the pommel of the longsword, this blank also was turned on a lathe. And although I have some knowledge and experience with lathes, this time I saw things, which I've never believed could be done on this type of machine. is the result at the end. Although I received this blade from the heat-treatment a couple of months ago, I got the opportunity to work on it just these days. Though it wasn't great progress, I managed to make the passes over the belt-grinder - grits 60, 120 and 180. From here I want to work in the old-fashion way - with stones by hand, as in times past long ago. This is one I'll be following. I really enjoy your work, both on the yushman project and this. i always like seeing the 'in process' photos. helps me out if i see something i can apply to my own DIY projects on the bench. Meanwhile in January, I tried something I've never tried before - to forge the guard of this sword. As mentioned - a fail. The slit is too long for my tang; nor the diamond cross-section is visible. Maybe I should deal with this for just a bit longer time, then I might get a "better" result. But in any case, I really like what I've done, mainly because I learned something new. For now, this piece of steel (I even don't call it guard) is just thrown away in the corner, waiting eventually to be used for suitable sword. This weekend I dealt with the guard and pommel. As the pommel is still in rough stage, I'll show only the guard now. Now, I had to form the diamond cross-section. This is going to be a really good looking longsword. That furniture and blade will make a beautiful, elegant, functional-looking weapon. Grinding the pommel, I was so absorbed in my work, that I made only a couple of pictures of this stage. Here, my greatest concern was how to properly clamp the pommel due to its strange diamond form. Now, the sides of the diamond are all straight. Later, I re-worked them, using the wheel of the bench-grinder as a pattern. As a result, after that the sides have hollow-ground shape. So, I already have a guard and a pommel. What I need is a grip. It was turned on lathe from beech. Then the round form was cut alongside in two equal pieces, and both were made thinner - up to the dimensions mentioned in the data-sheet. At the end both halves were rounded. Note, that I made them less with a couple of millimeters - in order to compensate the thickness of the wrap and the leather. So, now I have the whole hilt - although not ready yet I really like it. And wrapped in adhesive tape as a whole for some testing. Good appearance, elegant lines, comfortable for use with one hand, although the pommel is too heavy (quite normal - I don't have a blade yet). The work with both hands was - I don't know how to say - personally for me not the best quality of this hilt. But in any way, the handling characteristics will reveal themselves after the whole sword is assembled. Recently, the blade got its sanding. As you know, I prefer to make this by hand with stones and sanding paper, using a belt-grinder only in the beginning. Note that the fullers are left to be sanded last. Enjoying watching the process, the final result is bound to be worth all your efforts. Keep up the good work! The grip making method of lathe, cut in half, and thin to make it ovoid never occurred to me, what a great idea. That's looking wonderful! Very inspiring work on the cross and pommel, especially! Well, today I finished the blade. Generally, the Type XVa's don't appeal to me at all. I find them to be over-represented in the market and often generic in design. I like this one, though. Its proportions are quite attractive. The pommel type really does go well with the shorter cross, and the blade itself is sleek without being too linear. Very nice piece, looking forward to it when finished. There are four edges in the pommel of the original sword, that have always upset - to this day. So far the result is not what I want it to be, but at least a good progress was made. The edges of the original are more clearly pronounced, but there is still work to be done before this pommel is finished. For now, I just wonder if it would be good to mark additionally these edges with a chisel.